Like with my previous 10m experiment, I left the radio listening to 20m PSK (14.070 MHz) with fldigi sending the spots to pskreporter.info. Throughout the day, I grabbed screenshots of the map showing the spots at roughly 1-2 hour intervals. 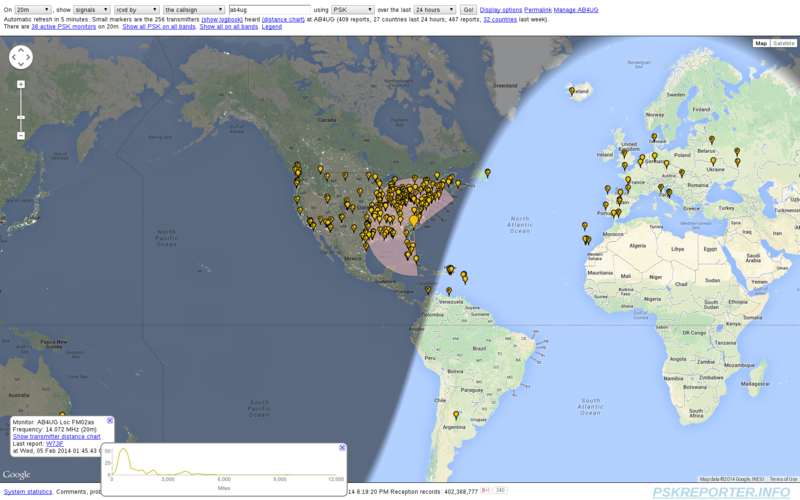 From about 2014-02-04 1100Z to 2014-02-05 0149Z (about 15 hours), these are all the stations that were spotted (click for the ginormous version). There was the usual progression of a few EU stations during the early morning and then lots of US stations throughout the day, moving from east to west. West coast stations were starting to come in pretty well by the time i decided to turn things off. I can usually hear a lot of South American stations when I’m playing PSK, but I guess most of them weren’t transmitting yesterday. I was also pretty surprised to see that Austrailian station (VK2KM) in there as well (spotted around 2100Z). Wish I was home to try to work it. You can check out the entire collection of spots over in my Radio Spots album on Google+. I think these are interesting experiments to do. I think 40m will be the next one. Might also be interesting to let it run overnight to see if the radio hears anything. Previous Previous post: 10m Moxon antenna is here!